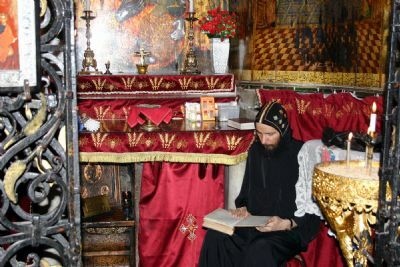 The Coptic (Egyptian) Church has several chapels in or near the Church of the Holy Sepulcher. They are one of the six major branches of Christendom that have “rights” in the church. The others are the Greek Orthodox, Armenians, Roman (Latin) Catholics, Ethiopians, and Syrians. Just to west of this chapel are some first century A.D. tombs - the so-called Tomb of Joseph of Arimathea. The presence of these tombs seem to indicate that the area where the Church of the Holy Sepulcher is located today was a burial ground in the first century A.D.